Are you having suicidal thoughts and feelings? Perhaps you are convinced that life is not worth living. Your life seems hopeless, like a black hole with all love, hope, and joy sucked out. David Powlison describes the various reasons you might be feeling hopeless and explains that God is not surprised or put off by your hopeless feelings.Your life is precious to God. He knows everything about you--even how many hairs are on your head. He wants you to bring your despair to him and cry for help. He will answer and replace your suicidal thoughts with hope for a future filled with love for him and others. 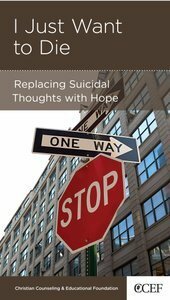 About "I Just Want to Die (Christian Counselling & Educational Foundation Series)"